After a long evening of torturous delay following a historic mid-term election turnout, the results were finally in and the blue wave promised by Nevada Democrats became a definitive reality. Republicans failed in several key state and federal races, gaining only minimal victories in the statewide 2018 general election. In Nye County, however, the result was the exact opposite, with the GOP sweeping the board and taking every available county post. 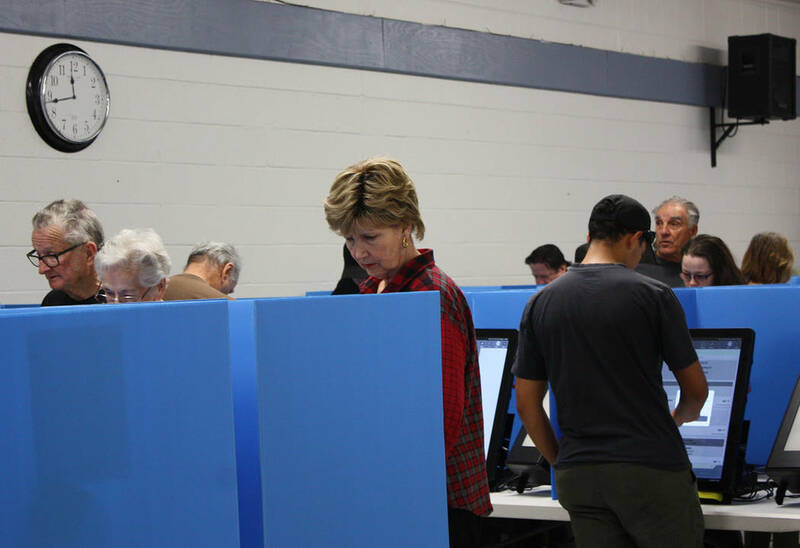 Robin Hebrock/Pahrump Valley Times Looks of deep concentration were evident on the faces of many Nye County residents as they carefully made their selections in the 2018 General Election. Heather Ruth/Pahrump Valley Times Voting was Nov. 6 in Nevada and Nye County. 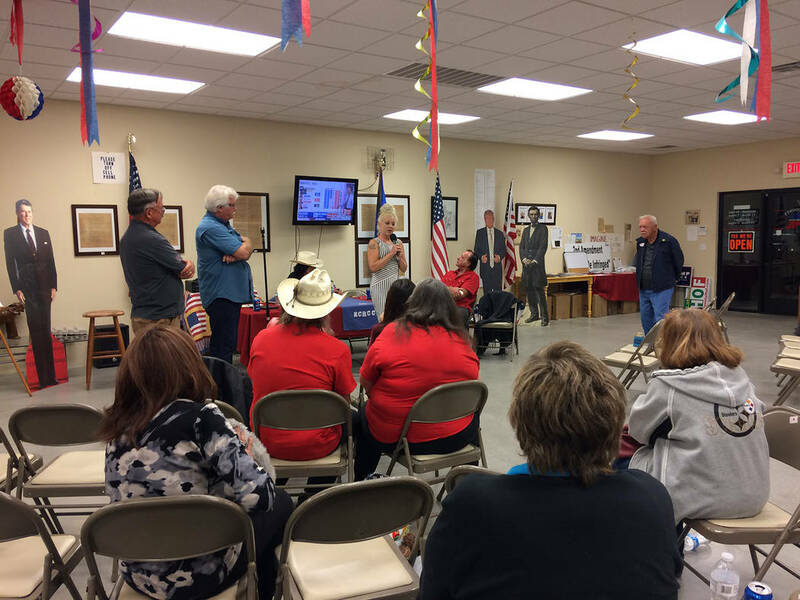 Robin Hebrock/Pahrump Valley Times The scene at the Nye County Republican Central Committee headquarters was somber on election night as Republicans celebrated the late Dennis Hof's win. Robin Hebrock/Pahrump Valley Times A Pahrump residents sports their "I Voted" sticker after casting their ballot on Nov. 6. Robin Hebrock/Pahrump Valley Times Nye County Republican Central Committee Chairman Joe Burdzinski is pictured signing in at the polling place on Election Day. Burdzinski has announced that he will seek appointment to the Nevada Assembly District 36 seat won by Dennis Hof on Nov. 6. While there were undoubtedly many races that Nye County residents found capturing their attention this election cycle, arguably the most locally watched was that of Nevada Assembly District 36. The late Dennis Hof, former brothel owner and Nevada businessman, had been locked in a battle with Democratic contender Lesia Romanov when he suddenly passed away. Despite his death, voters in District 36 handed Hof a posthumous win. Hof collected 63.12 percent of the vote to Romanov’s 36.88 percent. “Dennis was the Trump of Pahrump in the primary and Moses in the general. He didn’t make it to the promised land with us, but his campaign victory taught three big lessons for Republicans: Don’t raise taxes, don’t be boring and don’t be wishy-washy,” Chuck Muth, campaign manager for Hof in the 2018 election, stated on Hof’s behalf. 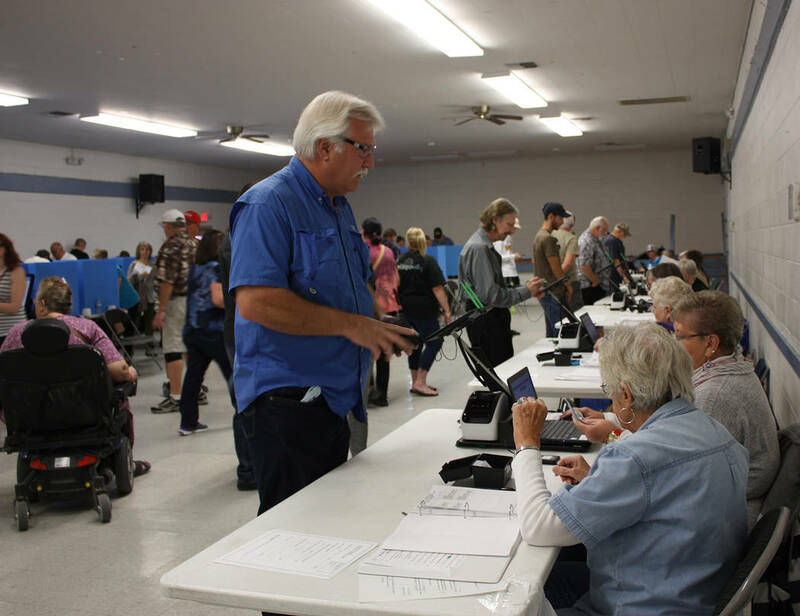 The Nye County Independent American Party made a concerted effort in the 2018 general election, entering candidates for four of the partisan Nye County offices up for grabs this year. However, the effort was in vain, with the Republicans dominating. IAP chairman Andy Alberti challenged incumbent Republican Sheree Stringer for assessor but he ultimately lost. The same results occurred for IAP candidate Sheila Winn, who threw her hat in the ring against incumbent Republican Sandra “Sam” Merlino in the race for county clerk. The Nye County recorder’s office will not see a change in leadership either, with incumbent Republican Deborah Beatty beating out IAP candidate Michael Noyes. Nye County treasurer was claimed by Republican candidate Pam Webster, who was against IAP contender Lance Roy Schaus. However, Webster resigned from her post in September and will not fulfill the four-year term. The appointment will be filled by the Nye County Commission. Beatty was also evidently excited and delighted with her win. “I would like to thank the citizens of Nye County for allowing me to serve another term as your county recorder. I’m excited to move forward with the projects we have in the works, as well as keep the office up to date in other areas. I want to thank my amazing staff for always offering the best customer service possible and my family for their unending support. Thank you all!” Beatty enthused. Two Democrats put forward their names for voters’ consideration as well, including Nicholas Del Vecchio and Richard Goldstein. Del Vecchio was hoping to secure the Nye County district attorney’s seat but he lost to Republican nominee Chris Arabia. Richard Goldstein was seeking the post of Nye County Commission District 4 but he fell to Republican nominee Leo Blundo. “The campaign – meeting people, learning about our community, everything – was a great experience and to top it off with such a great win, I am excited and ready to lead,” Arabia responded when reached for comment. 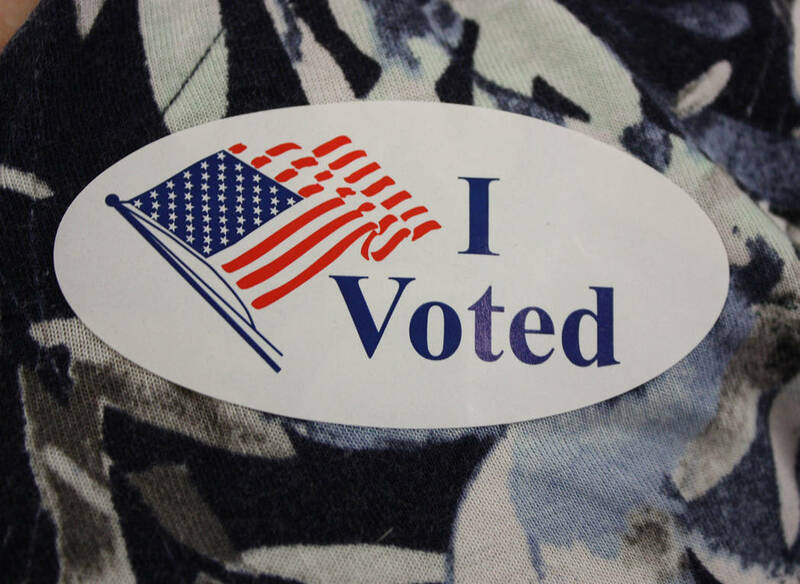 The nonpartisan side of the election gave voters much to sift through as well, with the Nye County sheriff and Pahrump justice of the peace seats up for election, along with school board posts and two spots on the Northern Nye County Hospital District. Incumbent Sharon Wehrly defeated Tony DeMeo in the race for sheriff while Lisa Chamlee edged out Frank Carbone for justice of the peace. Mark Owens won the Nye County School Board Area III seat over opponent Don Rust and Sean Hastings secured the school board Area V position over Tawnia Yazzie. Don Kaminski and Justin Zimmerman collected the two highest amounts of votes for Northern Nye County hospital district, beating Timaree Koscik and Horace Carlyle. Debra Strickland and Ginger Stumne were on the ballot as well but neither faced any competition. Srtickland was elected to Nye County Commission District 5 while Stumne was elected public administrator after triumphing in their Republican primary races. This was the case for Republican gubernatorial nominee Adam Laxalt, who conceded late on Tuesday night. When the totals were tallied, the results showed Democrat Steve Sisolak had emerged the champion, pulling in almost 40,000 more votes than Laxalt. Sisolak will be the first Democratic governor in the Silver State in two decades. Democrats also won in the battles for lieutenant governor, state treasurer, state controller and attorney general. Kate Marshall took lieutenant governor over Republican Michael Roberson and Zach Conine will hold the post of state treasurer after defeating Republican Bob Beers. Catherine Byrne managed to steal the seat of state controller from incumbent Republican Ron Knecht. Attorney general was another narrow call but yet again the Democrats rose to the top. Aaron Ford will now take over the AG’s office after having beat out Republican Wes Duncan by a margin of less than half a percent. The only state seats Nye County voters helped decide upon that were taken by Republicans went to incumbent Barbara Cegavske and Ira Hansen. Cegavske, the incumbent, nearly lost to Democratic challenger Nelson Araujo, with just over 6,000 votes separating her from defeat. Hansen beat out Democrat Wendy Boszak by a comfortable margin, garnering 21 percent more votes than Boszak. At the federal level, it was another night of blue triumph as Democrats claimed the U.S. Senate seat and three out of four available congressional seats. Republican incumbent Dean Heller fell to Democrat Jacky Rosen by a margin of exactly 5 percent in the race for U.S. Senate. For Nye County voters, the only congressional race locals voted on was that for Congressional District 4, which Republican Cresent Hardy and Democrat Steven Horsford vied over, with Horsford ultimately coming out the winner. Note: All results are considered unofficial until they have been canvassed. Source: The results come from the Nevada Secretary of State’s Office. Go to pvtimes.com for more election coverage and see our Facebook page for dozens of reader comments on the results and their voting preferences.